The Revenge of the Dwarves is the third book in the series (I thought it was a trilogy but there's a preview of a 4th book in the back of this book!!!). 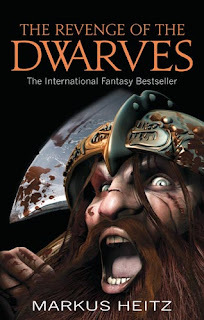 I didn't review the first two (The Dwarves and The War of the Dwarves) here (because I read them in 2009 and 2010, respectively), but I'll tell you now, they both got 5 stars and a whole lot of gushing from me. High fantasy at its finest. So, I feel like some of my feelings while reading this book were tainted by the fact that I couldn't help but compare it to two of my favourite books ever. There were some things I didn't like as much. First of all, there were times when I was confused. It seemed like I was supposed to be gradually learning things at the same time as the characters, but my memory wasn't quite as good as theirs, so instead I was like, wait, what? *flip back several chapters* Oooooh. It wasn't the end of the world or anything, but with the first two books I always felt like I knew what was going on, even as I was being shocked and awed. Also, there was this weird thing where characters' genders kept getting pointed out. I've always loved books (like the first two) that have male and female characters in various roles and just don't even make a thing about it. But suddenly in this book there were mentions of "dwarves, men and women alike". They're still sharing roles, just now it's being pointed out. Again, not a huge deal. OK bad stuff's over! When I try to look at this book without comparing it to its predecessors, it was still an awesome book. As always, Tungdil and friends have exciting adventures involving saving all of Girdlegard, Tungdil deals with the consequences of his wandering heart, Boindil occasionally goes crazy with blood lust, and Rodario manages to sleep with all the ladies without being an annoying character. The setting is one of my favourite fantasy worlds. Girdegard is a region surrounded by mountains, which separate it from the mysterious Outer Lands. It's split into six human kingdoms (and queendoms; did you know that's a word?). There are five Dwarven kingdoms and queendoms in the mountains, where the dwarves protect Girdlegard from invading monsters. There are also elves, who are both beautiful and secretive! (Oh, high fantasy. Your species are so consistent.) The world is so well developed that you can really feel like you're in the story. And the characters have such full personalities and backgrounds! Markus Heitz is a truly brilliant weaver of worlds. So, all those opinions might have seemed a bit confusing, but overall my feelings are very positive. If you've read the first two, you have to read this one, and if you haven't read the first two, you have to read the first two! Four out of five stars, and a recommendation to anyone who likes high fantasy.